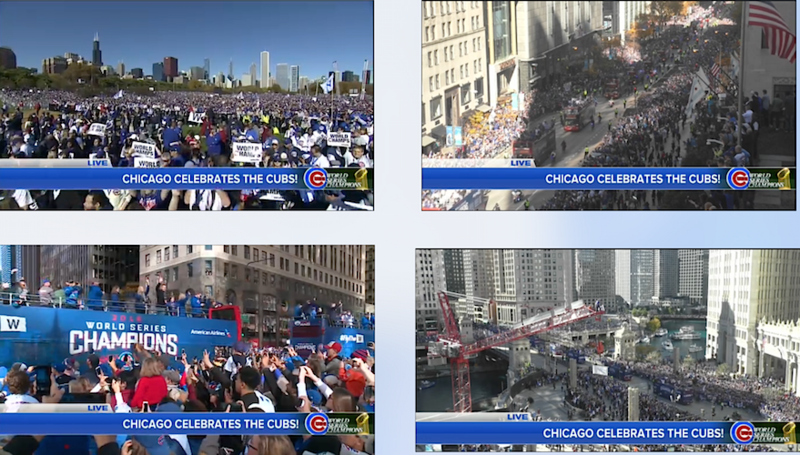 Well, after 108 years of waiting, Cubs fans couldn’t have asked for a much nicer day for a parade last Friday. They say there was a total of 5 million people who lined the streets or were on hand for the “Cub-stock” rally at Grant Park. According to Major League Baseball’s web site, it was the seventh-largest gathering of human beings in world history… and the largest ever in the Western Hemisphere. Since the parade, Cubs players have been to Disney World, appeared on Saturday Night Live, and taken the World Series Trophy to a Blackhawks game. 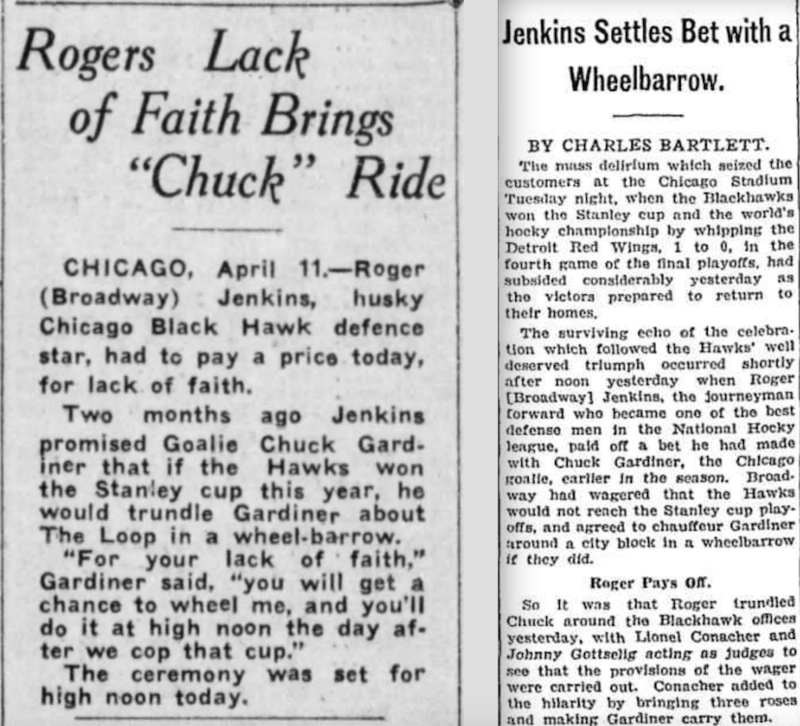 None of them, however, have attempted to duplicate the old Blackhawks’ celebratory feat of rolling a star player through the downtown business area in a wheelbarrow. 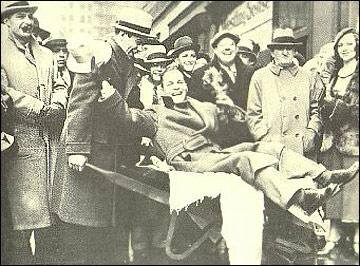 He did it again with Mike Karakas in 1938. 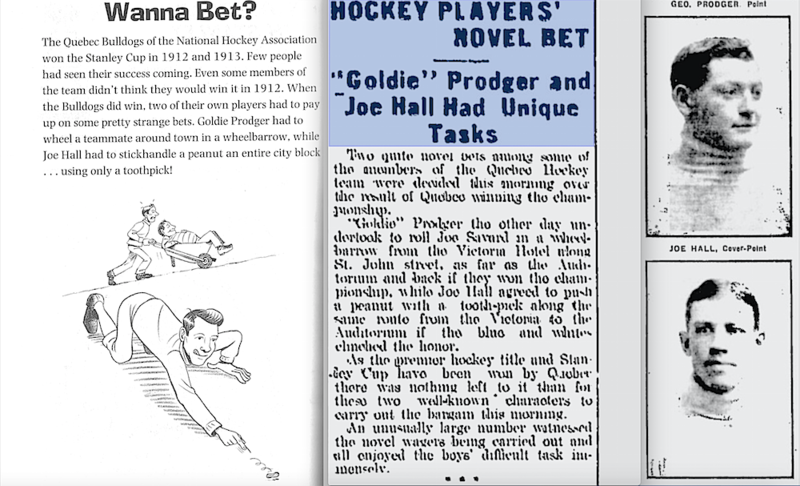 But it seems that this odd wheelbarrow tradition dates back nearly as far as the Cubs’ last World Series win in 1908, as it may well have begun with hockey’s Quebec Bulldogs in 1912 – a story that appears in a couple of my children’s books and which I often tell when I’m visiting classrooms. Very interesting read! Thanks, Eric. Eric, if you were a detective, crime would drop 23%. Nice work, as always! And making that list is pretty impressive also! You find the best subjects and tell them in the most interesting way — always! LOL re wheelbarrowing! The Cubs should jump on that! Re ‘gatherings’; I’m not sure where this ‘list’ originates and not meaning to be contrary but simply…’just saying’…I recall reading a news early this year after that Imam (I forget his name…IF I ever knew it) died in prison in Baghdad and that the 12 million who gathered for his ‘martyrdom’ was one of ‘a dozen or more’ similar religious themed events that had drawn more than seven (7) million souls IN HISTORY. I also distinctly remember a gathering of over 10 million ‘Red Guards’ in Beijing, China some years ago…it was all in the news! The numbers on gatherings come directly from the MLB.com story about the parade … but I admit I did nothing to try to verify it!